Before joining Vanderbilt University, I had the good fortune to serve as the Director of Literacy and Technology at CAST, a non-profit research and development organization dedicated to improving student learning and engagement through the integration of universal design for learning (Rose & Meyer, 2002), technology, and subject matter content and skills. 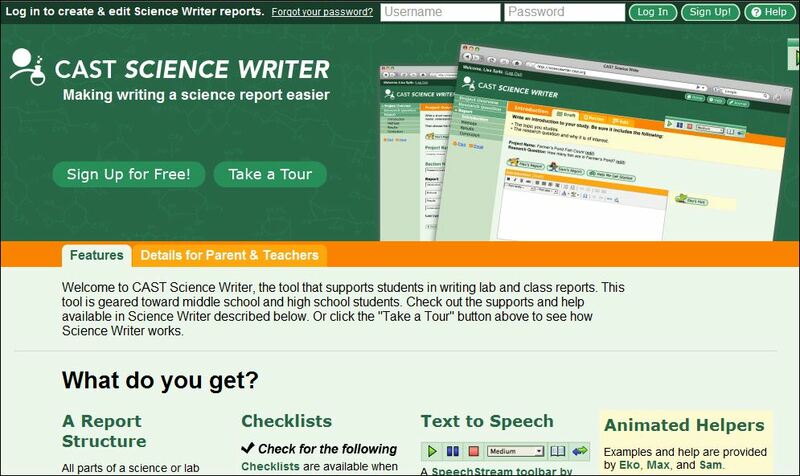 Today I want to feature Science Writer, a free online writing tool developed by Tracey Hall, Elizabeth Murray, and CAST colleagues. It’s a wonderful example of how to scaffold students’ writing in relation to the demands of a particular writing genre, in this case, the science lab report, or more generally, the science report. The tool is designed for use with middle school and high school students, but might also work for upper elementary students, depending on their skill. How does Science Writer work? Science Writer steps students through the process of writing a report with introduction, methods, results, and conclusion sections. Students draft, revise, and edit their report, using just-in-time support from pedagogical agents who offer models and information about how to write each section. They may also access content and editing checklists to help them evaluate their writing and make revisions. 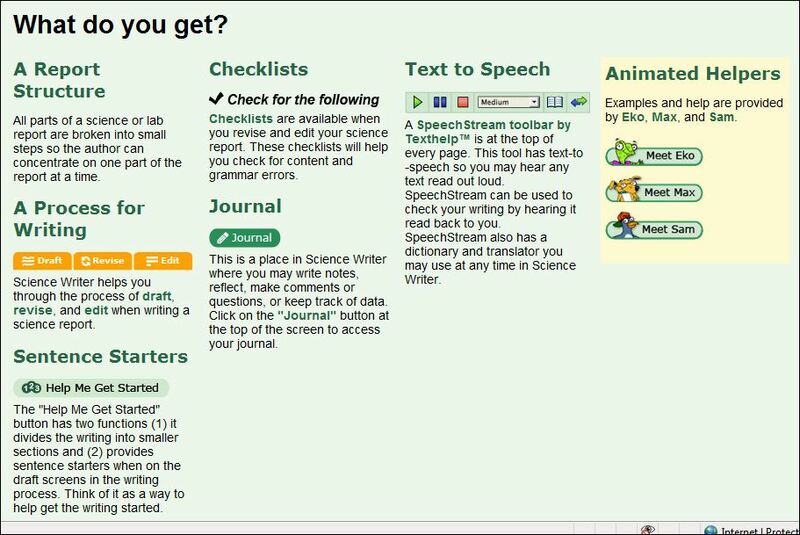 And finally, students can use the embedded text-to-speech tool to listen to their writing to see if it “sounds right” and to listen to any of the directions and instructional material, as well as accessing vocabulary definitions. Each student has their own Science Writer account and teachers are able to view students’ work and provide feedback throughout the writing process. Science Writer supports students through their writing process. Is there research support for Science Writer? In a study funded by the US Department of Education, Hall and Murray (2009) found that students using Science Writer improved writing and science comprehension skills. A field test study is underway and results should be available soon. You can find additional information about their research at http:///www.cast.org/research/projects/tws.html. I recommend you check out Science Writer – if it’s not the right fit for your grade level or subject matter, please share it with your favorite middle school or high school science teacher! 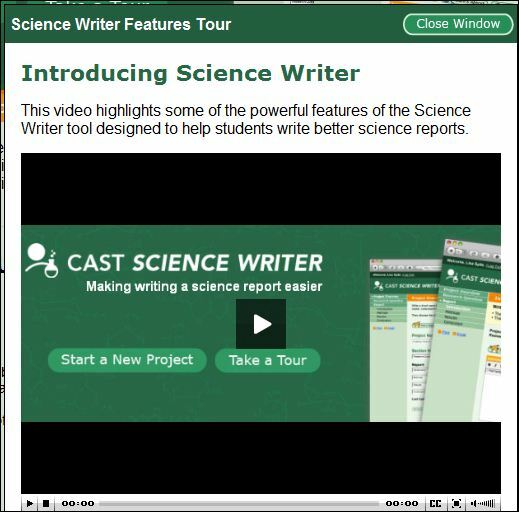 This brief video for students explains how the Science Writer features can help them write a more successful science report.